Room size: The Elephant Cave sound platform is 3 x 4.5m with a 2-story slanted ceiling above; four steps below continue into an 8m long combined open kitchen, dining room and office, an area which widens to 5.2m with a 2.8m ceiling; the sound platform space is open to a 2nd story landing and, via spiral stair case, to a 3rd-floor studio; concrete floor, concrete and brick walls from a converted barn with no parallel walls nor perfect right angles; short-wall setup with speaker backs facing the 8-meter expanse and 2nd-story landing. Rho is the 17th letter of the Greek alphabet and in their numerals system has a value of 100. But it can also represent any number of things in the sciences, such as the spectral radius in mathematics; material density or resistivity in physics and more. So when a designer calls his smallest of three speaker models Rho, we assume a thoroughly engineering-driven approach, not a poetic reference to the yellow hyper giant in the constellation of Cassiopeia. But back to the beginning. Hats need places to hang 'em from. Hooks. Speaker designers use time-domain coherence, broad off-axis response, limited excursion, high sensitivity, limited dynamic compression, reduced group delay, crossover simplicity and any number of attributes and aspects for hooks. Austrian speaker designer David Haigner hangs his hat off good efficiency; linearized impedance; time alignment; and constant directivity. Physics, not to mention countless pro-audio firms. Add David Haigner to this crowd. 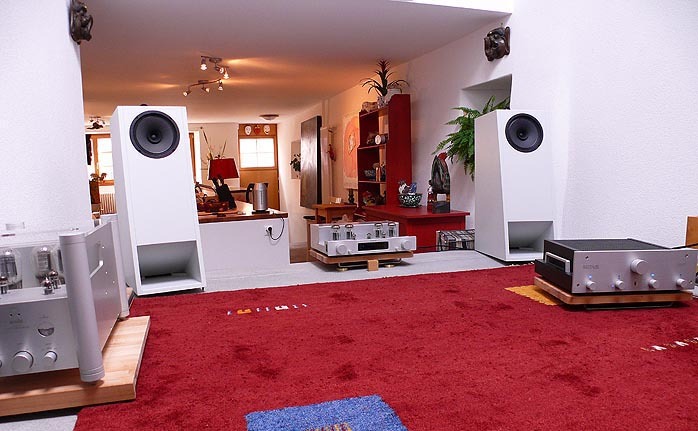 Having plied his trade for 10 years, he has authored two full-range hornspeakers, the Alpha and Beta. The Alpha runs dual 18s in a front-loaded bass horn configuration with a coaxial compression driver for a 3-way 103dB concept. 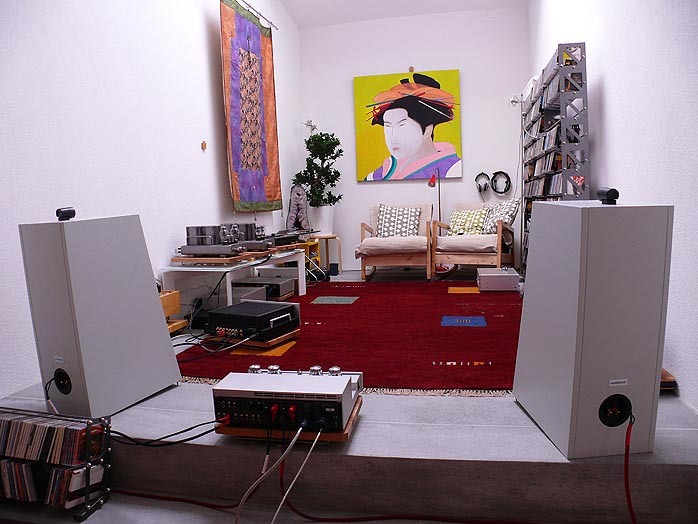 The Beta [left] works a single 15-incher mated to a mid/treble compression driver for a 96dB 2-way system. Both models are time-aligned. The Alpha horn requires a 35m² + space to spread its wings and actually sees 60m² in Austrian distributor Reno Barth's digs [photo below]. The Beta likes from 25m² on up. Space huggers unkeen on space hoggers now have the Rho. That's the smallest member of team Haigner to date though the forthcoming single-horn Gamma (to be used with various external 15" subwoofers) will be smaller yet. The Rho is a 2-way multi-chamber rear-hornloaded speaker around an 8" mid/woofer augmented by a small bullet tweeter. With dimensions of 28 x 81 x 51cm WxHxD and a readily manageable weight of 30 kg each, it's not the 90dB voltage sensitivity that's special on paper but the impedance curve: 7 ohms +/- 1 ohm from 100 to 20,000Hz. Low-power lovers of the SET variety (triode or transistor) recognize this as a virtue. 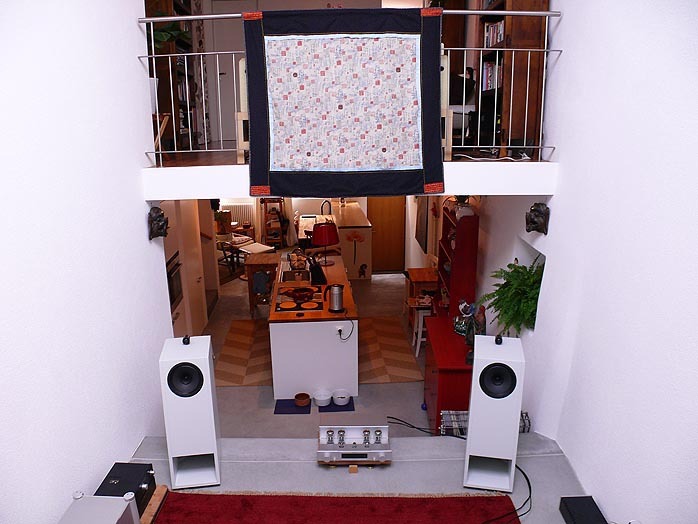 Haigner's involvement with loudspeaker design goes back to 1982 yet he didn't commence building horns until 10 years of research and development had passed. No instant gratification for our Austrian. 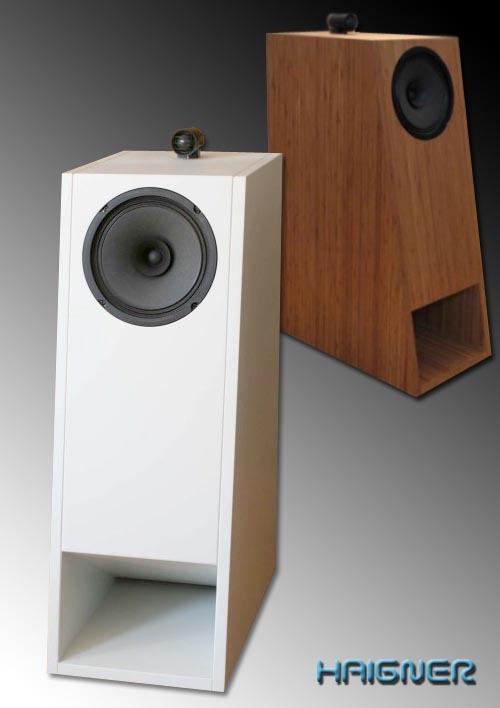 "The higher efficiency speakers at the time had poor directional and tonal characteristics. The 'modern' lower efficiency models, while behaving more linearly, lacked dynamics and sounded somewhat lifeless, sterile or simply not like real music." 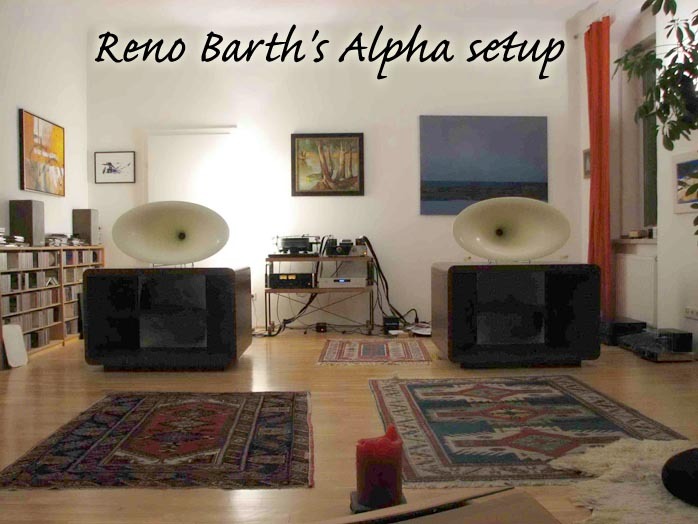 Reno Barth, friend and high-end distributor who had dropped off various commercial speakers for Haigner to modify over the years, finally commissioned him to design a statement horn system. Thus the Alpha was born, opening a can of worms: "Less than 1/10th dB changes over 1/6th octave were clearly audible, the quality of cables and other parts became design issues instead of a fine-tuning playground". Thus Haigner refers to the increased resolution of properly designed constant directivity horns. Enter radiation resistance. It describes how slow-moving drivers at low frequencies radiate predominantly sideways. This reduces sound pressure generation because the diaphragm encounters little air or radiation resistance. At higher frequencies, the air can't escape laterally, is compressed in front of the diaphragm and results in efficient SPL generation. As long as the half wave exceeds the diaphragm diameter, radiation resistance increases until a state of equilibrium is reached (driver diameter matches the ½ wavelength, i.e. 1kHz and 17cm). Above that point, radiation resistance remains mostly constant with rising frequencies as the membrane's size gains relative to the shorter and shorter wavelengths. To maintain equal bass amplitude however, this means that at falling frequencies, excursion requirements double per octave to keep up. 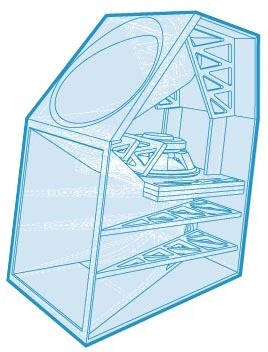 By preventing sideways escape when air is faced with a forward-moving diaphragm trying to compress it, a horn or waveguide increases the radiation resistance seen by the diaphragm, hence its sensitivity increases as well. For a simple example, Haigner cites an open pipe. Its diameter is identical to the driver's diameter. Inside the pipe, pressure generation remains efficient even into low frequencies. Alas, the wave front encounters something similar at the end of the pipe as a direct radiator. When the pipe diameter gets significantly smaller than the half wave, radiation resistance shrinks. The end of the pipe thus suffers significant pressure loss. As a rarefaction wave, this reflects rotated by 180 phase degrees back into the pipe. As this wave returns to a compressed diaphragm, the matching frequency (pipe length = ¼ length wave with its harmonics) turns pipe resonance. It overlays the original signal without at all improving the sensitivity at lower frequencies over direct radiators (aside from the resonance lift of course). To avoid these pipe colorations as well as resistance losses, a horn flares our pipe outwards as distance to the diaphragm increases. The mouth surface becomes significantly larger than the driver to increase its radiation resistance. If the horn mouth is sufficiently large, it also avoids the sudden pressure drop of the wave front and with it, eliminates the horn's pipe resonance. From that follows that the horn mouth diameter should be at least as large as the half wave of the horn's lower cut-off frequencies in free space (a bass horn placed on the floor operates at half its mouth surface). The lower horn cut-off below which the horn effect drops drastically operates in the range of the first resonant frequency (¼-wave resonance) of an equivalently long straight pipe. This determines that a horn should be at least ¼ as long as its cut-off wavelength while the horn mouth diameter should correspond (at minimum) to half its wavelength. Horn geometries -- round, oval, rectangular -- influence this math further. Here we'll merely add that traditional horn formulae do not apply to the elliptical cross sections Haigner has developed; and that optimized horn geometries remain specific to certain drivers and won't work as intended on others. Designing a coloration-free horn relies thus on plenty of trial and error. Translated, it becomes a real pain and not something most commercial firms would ever embrace voluntarily. Should we assume that Haigner is one tenacious character? To the tune of 10 years. Indeed.